Clearly I have not been updating this blog, but one of the reasons for that is that emulation has become much more user-friendly in the past few years. You no longer have to “get your hands dirty” to emulate a ton of game consoles on MacOS. Thanks to OpenEmu (covered here previously), emulation of about 30 consoles “just works.” We also now have RetroArch, a competing multi-system emulator that works on far more than just MacOS. In the past, adding CD-based games to your “library” in OpenEmu was hit-or-miss. Now, if you have a game that is a .bin/.cue file pair, you just add them as a pair, and they show up correctly without any trouble. As many Playstation 1 era games are turning 20 years old now and Sony has abandoned any concept of backwards compatibility, it’s great to have an easy way to manage an archive of our collections. When you add a game to your library, the box art thumbnail just shows up automatically, no further action required on the user’s behalf. OpenEmu does not apparently support emulator tweaking (no super-hi-res PS1 emulation or widescreen hacks), nor does it support netplay, or streaming. It’s a single player (and local multiplayer) multi-system emulator front-end. (Technically we have to call it a front-end, because it’s just providing a unified interface to a collection of already-existing emulators). The RetroArch default interface is an homage to the Sony PS3 and PSP’s “cross-media bar” (also known as the XMB) design. If it works don’t fix it, I guess. The reason this UI makes sense for RetroArch is that it can be entirely game-controller-driven. Controller support is automatic: plug and play. I didn’t need to spend any time at all in RetroArch configuring my PS3 controller, I just plugged it in and that was it. Painless. Well, I did have to hit the PS home button. The rest of the UI is not so painless though. I experienced multiple bugs running it on MacOS: using the window frame controls to go full-screen corrupted the picture and I had to use the in-app setting to change it to full screen, instead. I had major problems and inconsistent results launching Playstation 1 games. Loading a game before you load its corresponding core may or may not succeed. You may get stuck in a menu tree where you can’t go back without closing RetroArch. If you ask it to download something in the background, it will get to 99% and then halt all emulation for a few seconds before reaching 100%. It’s a lot of little annoying things. If you double click anywhere on the interface, such as by accident, it just instantly quits RetroArch. If you accidentally hit the ESC key, it instantly closes RetroArch. If you run RetroArch, you basically don’t want to use it without a controller. If you want box art thumbnails, you must direct RetroArch to download an entire set for a given system, regardless of how many of those games you actually own. Likewise, RetroArch doesn’t have any emulation cores when you first run it. You have to flip through its menus and download each individual one that you are interested in. Unlike with OpenEmu, it’s unclear if there is any kind of automatic updating for these cores or if that’s a manual step also. All of these sharp edges aside, RetroArch is an amazing project. It promises to do for everyone, what OpenEmu did for MacOS users. It also has some unique advantages, including: netplay (including spectating), achievements (via RetroAchievements.org), recording and streaming. Either OpenEmu will expand its feature set to compete with RetroArch, or RetroArch will improve the usability of its UI. Either way, the future of emulation is looking bright. Over the weekend, I compared the latest Mednafen PlayStation emulation with the latest PCSXR, and Mednafen emulation is currently ahead. It may not yet have all the upscaling functionality of the Windows PCSXR, but for Mac OS X it seems to be the best available PS1 experience. Where PCSXR occasionally had missing audio, skipping during loading screens, and long loading pauses at a black screen for unexplained reasons, Mednafen delivered the genuine experience. Luckily, it can be easily found in the experimental build of OpenEmu. Before realizing the OpenEmu “experimental build” incorporates a working copy of Mednafen, I worked through all the steps to build and run Mednafen source code at the command line. If you still want to experiment with the latest versions of Mednafen yourself and not wait for the OpenEmu team, keep reading. Copy the appropriate PS1 BIOS file(s) to ~/.mednafen/firmware/ . For more on my difficulty with finding the correct files for this, see my previous post. Unlike other PS1 emulators, Mednafen requires the cuesheet format for its ROMs. See my previous post on the cuesheet format and how to re-rip a game in that format or add a CUE file to an existing raw disc image. Apparently, Mednafen also wants an .SBI file, even for games that should not need one. If a game does need an SBI file (because it was published as a LibCrypted disc), the SBI file can be downloaded from PSXDB Redump (link “SBI subchannels” on protected disc page). http://redump.org/disc/28260/ With the game I was testing, an SBI file should not have been required, so I tried renaming an SBI file for some other game just to shut it up, and this seems to have worked. In a previous post, I mentioned that two command-line utilities for making optical disc images on Mac OS X were dd and cdrdao, but I recommended dd because it was simpler to use. Well there’s actually a case where cdrdao is needed, and that is when your emulator wants game images in the “cuesheet” format (a pair of files with the file extensions .bin and .cue, rather than a single .iso or image file). Why do we need the cuesheet format? I mentioned in my first post in this series that many old games use “mixed-mode discs” (audio and data as separate tracks). You can rip all of their data, but without metadata to indicate the track boundaries, it seems that multi-track disc images can’t be properly handled (?). Most 16-bit era CD games were this kind of disc, and sometimes it was used in the early games of the PS1/Saturn generation. I realized the need for cuesheet format when I tried to use the Mednafen emulator to play a Playstation 1 game I backed up in ISO format. It would fail with weird errors unless I provided the game in cuesheet format. Almost any cuesheet file can be found at Redump.org. In fact, you can just download every cuesheet for a given system all at once, which is nice. Maybe it will preclude you from having to create your own, if you ripped your games as ISO. Note that your binary image file has to be named consistently with what is in each CUE file. Most games from the Windows-era of PC gaming (as in, pre-modern/pre-Steam-era, or roughly 1995-2005) can be run on Intel Macs (Macs made after ~2006) thanks to a compatibility layer called Wine. Years ago it was called “Windows Emulator,” but later it became Wine Is Not An Emulator. And it’s not – it doesn’t translate instructions, it just translates functions (“system calls”) from Windows to POSIX, which they call a “wrapper” (wraps the Windows software to intercept its Windows API calls). Even though it’s technically not an emulator, it fits the theme of this blog. Here’s a walkthrough. Wine itself is a command-line program, installable via MacPorts. But you wouldn’t want to run it that way. So there are a couple of different choices for GUI front-ends. WineBottler, which is the easier option to use and has a nicer looking UI, but doesn’t support using different versions of Wine per application, which you might find helpful for older games that can run on Windows 95 but crash on XP. Wineskin Winery. Sometimes referred to as just “Wineskin” or just “Winery.” The UI is very unfriendly, but does offer a little more configurability than WineBottler, and doesn’t have any donation-begging, nor do you have to suffer through ads in order to download it like you do with WineBottler. Here we’ll go through an example with Wineskin Winery. When you launch Winery, you pretty much just have an empty window with the option to download and install an “engine,” which is the underlying version of Wine that will be used to create a compatibility “wrapper” for a particular game. Clicking the ‘+’ button, the choices (as of the time of this writing) include one called WS9Wine1.7.30. But what you want to do is ‘Download and Install’ one of these engines, probably the newest one. This should return you to the main menu, whereupon you have to click ‘Update’ under ‘Wrapper Version’ if it still says ‘No Wrapper Installed.’ Winery confuses the user by referring to the wrapper-generator component as the “Wrapper” – no, the wrapper is what you as the user are expected to create. Anyway, hit that update button. Now, finally, the ‘Create New Blank Wrapper’ button should be activated. Obtain a copy of a Windows game. I’ll use a silly imported Japanese game (for Windows 95; released 1996) as our example here. I have a folder of files for the game that includes an EXE and some other stuff. In Winery, click “Create New Blank Wrapper” and give it a name, which will create a Mac OS X app bundle by the same name (e.g., “MyCoolSoftware.app”) at the end. During creation of the wrapper/app bundle, you might be asked to install Mono for .NET games or Gecko for games with browser components. For some games these might be unnecessary, but the fastest way to know is trial & error. Even without the additional components, the resulting empty wrapper is a whopping 166MB. If you double-click on ~/Applications/Wineskin/MyCoolSoftware.app, you might expect the application to launch. Nope! Mac OS X complains that it cannot be run. And yet if you attempt to run it a second time, it works and you will now be presented with wrapper options. This seems like a bug, but that’s how it goes. In the panel that appears, you must click ‘Install Software,’ even if the game is self-contained and doesn’t need an installer step. In our case, because we suspect the EXE we have is the game itself rather than the installer, we choose ‘Copy Folder Inside’ to make a copy of the game within MyCoolSoftware.app. Taking a guess, we select GAMENAME.EXE in its top folder, as the executable that will start our program. Now you can double-click the MyCoolSoftware.app in Finder, to launch your game. Starting up our game, we see a title screen and a couple notes of music! Then, it crashes. A Windows dialog pop up for “encountered a serious error” appears, and we are forced out of the program. All we can tell from this is that the failure happened when the program tried to read an address that it couldn’t. If this happens, one possible solution is to go to the Wine HQ application compatibility database and search for the game, or for the publisher, or the original Japanese title, or even the original developer. In my case, nothing returned any results. It turned out that in my case, it was a bug in the game itself – an incompatibility with Windows XP. It supposedly worked in Windows 95, but not in later versions of Windows. While you can configure Wine to report the OS version as Windows 95, that was no help in this case. Neither was switching to a much older Wine engine. Luckily, there was a patched version of the EXE for the game with XP support, so I changed the wrapper to point to the fixed EXE, and I was good to go. Because Wine “emulates” Windows XP, in rare cases like this you’ll have to first find a way to make the game XP-compatible. 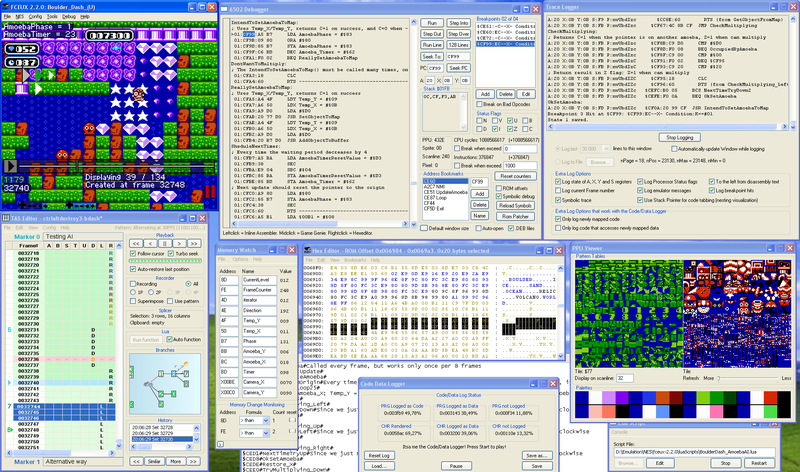 Fceux is a cross-platform, open-source NES emulator. There are other options for NES emulation on Mac OS X, but FCEUX offers tools for debugging, rom-hacking, map making, Tool-assisted movies, and Lua scripting. Basically it’s the “hacker’s choice” of NES emulator. Unfortunately, some of those hacking features are exclusive to the Windows version currently (boooo), so maybe the project needs some help from Mac users. Or, you might just want to have a version of Fceux that is not 18 months out of date, because the project hasn’t released a binary since 2013 despite the fact that bugs continue to get fixed. Let’s show how to build their source code on Mac OS X. First, we need to install all of the dependencies. I assume you already have XCode installed with the command-line tools, and that you’re using MacPorts to install open-source packages. Note the versions of things here. At the time of this writing, you don’t want the latest Lua; Fceux will fail to build. April 2016 edit: I added pkg-config to this list of dependencies. Optionally, we can build and run the server component, for network play. Network play allows two (or more?) instances of Fceux to share game-state by continuously syncing, over the network. The SEGA Saturn was long said to be impossible to emulate, because of its unusual (ridiculous) architecture that incorporated eight processors (two Hitachi SuperH SH-2 processors, one Hitachi SH-1 processor just for streaming and decompressing from the disc in realtime, two “video display processors” from SEGA, a Motorola 68EC000 for sound, another custom SEGA DSP chip for sound built by Yamaha, and finally something called the System Control Unit). Before the days of multi-core processors, parallelism meant having multiple chips. It was expensive, hard to program for, and its graphical abilities were best suited to 2D. There were a string of Windows-only closed-source emulators, including SSF, Giri Giri, Satourne, etc. They have all been abandoned (or in the case of Giri Giri, sold to SEGA). The Yabause emulator carries the torch now. It’s open-source. It builds on Mac OS X and even ships an OS X binary, in an app bundle too! You won’t need much help getting it to work. With a game ISO (original disc in your system, or disc image – see my earlier post on imaging your original discs), and a Sega Saturn BIOS file, you are good to go. The first thing to do is to open Preferences, and point it to the location of your Sega Saturn BIOS file. Also uncheck the box for “Enable BIOS emulation” unless you were unable to find a copy of this BIOS file anywhere. Next, go to the Audio/Video tab. Audio just works, and there’s nothing to change. Graphics are another story. With the current version (0.9.13) the OpenGL graphics renderer shows no graphics at all (just a black screen with audio). Then if you go to fullscreen, it crashes the emulator. The software graphics renderer is not fast enough to be playable; with frameskip turned on, the game is playable, but you wouldn’t want to. The third option is the “Grand Central Dispatch” graphics driver, and this actually works well. Not 100% speed but close. But the real fix is downloading Yabause version 0.9.12, which had a working OpenGL mode on OS X. They appear to be aware of this bug and it might get fixed in the next version. Also, if your system is fast enough, it will actually cause issues with emulation speed unless you check the option in the menu bar: Emulation -> Enable Frameskip. The emulation speed is not perfect all the time, but this keeps it on target as much as possible. There is no support for controllers at the moment, so you have to play with the keyboard. That may be okay for some games, but I hope that controller support comes quickly in a future version. The work-around for now is to run a tool that maps keyboard keys to a controller’s inputs. On Mac OS X, your choices are ControllerMate ($25) or Enjoy2 (free, open source). Download and run Enjoy2.app, and then get your PS3 controller to Bluetooth pair with your Mac. Now it should automatically show up in Enjoy2. If you press a button on the controller, it will jump to a place in the list with an auto-generated button name (up on the d-pad will be “Button 5 (null)” but don’t worry about that). For each key you want to assign to a controller input, just set it to “Press a key” and then in the field next to it, hit a key on the keyboard. When done configuring, hit the “Start” in Enjoy2. You can test your mapping using a text editor; you should be able to type with the PS3 controller. Now, over in Yabause, configure the emulator with keyboard keys matching the ones you set in Enjoy2. This should work great unless you need analog, which few Saturn games supported anyway (and none required, to my knowledge). Also, at some future point it would be great if mouse input could emulate the light gun, or two sticks could be used for Virtual On. But now I’m just dreaming. In order to save games (Yabause doesn’t support the emulator concept of “save states”) you have to go to Preferences, Memory, and then under “Internal Memory”, enter a pathname to somewhere on your system where you want the Saturn’s internal battery-backed RAM to be stored. It can be anywhere and named whatever, as long as you have write permissions to that location. You can do the same thing to create a file-backed emulation of a Saturn expansion cartridge. Yabause will write the files when it quits. Getting in and out of full screen is janky; you can get into full screen mode using the menu bar, but to get out, the usual keys like ESC don’t work. You have to hit Cmd-F to toggle out of full screen. Or Cmd-Q to quit, that also works. Redump.org is a disc preservation database and internet community dedicated to collecting precise and accurate information about every video game ever released on optical media of any system. The goal is to make blueprints of the data on console and PC game discs.